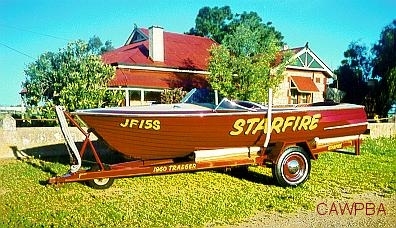 Paul Siddall from South Australia completed an 18 month restoration of his 1960 Traeger runabout. Starfire has been in Paul's family since new. 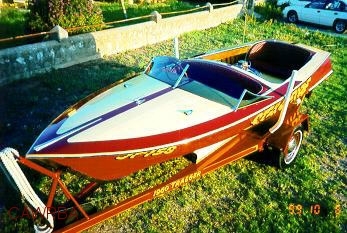 The 16' 6" hull was ordered by his father (the Traeger's built only one other open plan hull) at a cost of £360/-/- ($720.00), with the all up cost on completion being £1200/-/- ($2400.00). 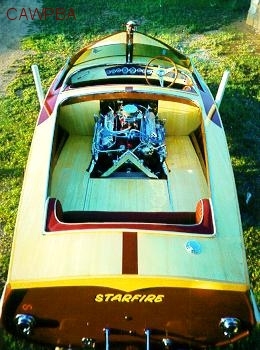 Originally fitted with a Dodge sv 6 cylinder engine, Starfire was fitted with a 289 Ford out of a Mustang. 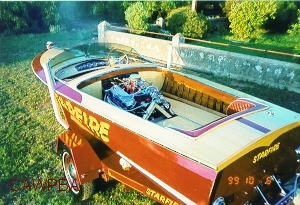 Although the engine has not been touched in decades, it still pushes the boat along at nearly 60 mph. A new deck closely matching the original ash has been fitted using 400 stainless steel screws, all countersunk and plugged. 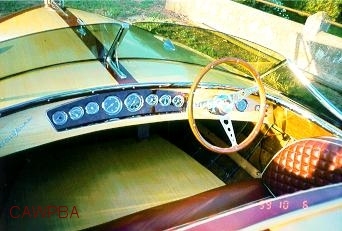 The dash around the instrument cluster is walnut, a la Jaguar. Anything that could be removed was chrome plated. The hull has been stained, with Paul mixing paints until he matched the original colour. The paint was then thinned down and wiped on with a rag and then cleared . Paul says the project could not have been completed without the help of his father and his son.